Unfortunately, that noise that’s so much fun when you’re the one on the throne can drive other people – especially neighbors – nuts. So, you have a couple of options: 1) Pay to practice in a practice room, 2) Purchase an electronic kit. You might think it just won’t be the same, or, won’t it be a waste of money? However, there are a lot of decent electronic kits these days, that can get pretty close to the feel of a ‘real’ kit and have some extra benefits, too. 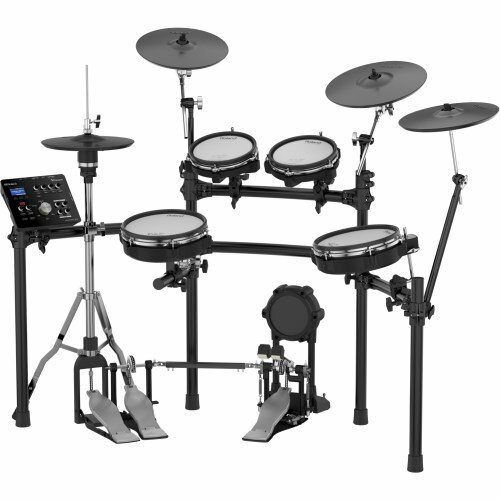 There are a host of benefits to electronic drum kits that you might not have yet considered. Here are a few to think about. One of the most fun parts of playing on an electronic kit is experimenting with the sounds. When you have an acoustic kit, you’re limited to just that, whether it’s a rock kit, jazz kit or whatever. When you have an electronic kit, you essentially have all the different kinds of kits! These electronic sets of pads can often trigger multiple different pre-set kits, as well as giving you the option to create your own, hybrid kit. When you think of it like that, electronic kits are suddenly the opposite of limiting. As well as giving you creative options, these kits can open up performance doors. Drum kits can be a pain to set up, to sound check, and sometimes they can even be difficult to fit on the stage. These kits are smaller, consistent-sounding and a lot quicker to set up. Also, you don’t have to tune them! If you’re sick of loading and unloading, then setting up, tuning and sound checking all the different components of your drum kit, it might be time to consider going electric. 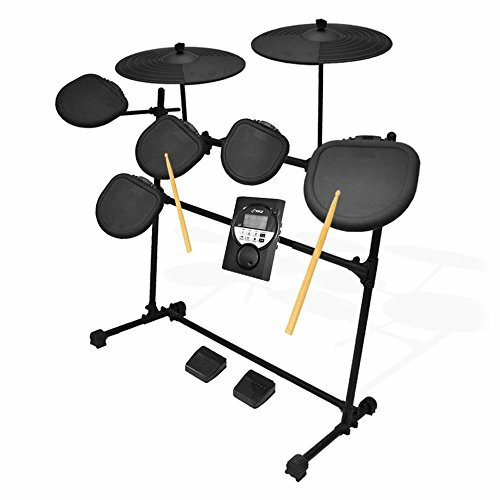 Probably one of the most common uses of electronic drum kits, these devices are perfect for learning on. You can use headphones, so your neighbors aren’t disturbed and a lot of them include metronomes, so you can perfect playing in time. Some electronic drum kits even have a ‘coaching mode’, offering feedback as they ‘listen’ to you practicing. A lot also have built-in audio tracks to play along with, or USB / AUX inputs to insert your own. They might not be quite as much fun as big, noisy, acoustic kits, but you’ll certainly be able to practice a lot more, therefore improve faster. Some electronic kits are extremely clever. They are so responsive, you can perform flams, ghost notes, rim shots, and even hit the cymbals in different places to get different sounds. Just like you would on a real kit. Many are even able to mimic a ‘choking’ of the cymbals. The benefit of an electronic kit over a big acoustic kit is that it’s smaller, easy to transport and – importantly – your sounds are going to be more consistent. As we’ve already pointed out, you don’t need to tune these kits, or undertake extensive sound checks as each individual drum is mic’d up, or worry about aging/breaking skins. There’s an added benefit of getting on better with sound engineers here, too. Parents, if your son or daughter has suddenly announced that they’d like to play the drums, you might be panicking. That might be why you’ve landed here. Well, electronic kits are little to no threat to the noise levels in your home. They make a little bit of noise, as hitting anything with sticks and foot pedals will (especially if it’s a double bass drum pedal), but it’s nothing that can’t easily be drowned out. Practicing through headphones can also be great for children’s (and older learners’) confidence, as they don’t feel vulnerable to the pressure of others listening as they learn. This also means that practice hours aren’t limited. If you (or your child) would like to practice in the early morning, that’s no problem. If you play the drums a lot, your ears are going to suffer. You could wear earplugs, but many people can’t stand the sensation or the way that these seem to block sound. It’s not conducive to musical creativity. If you’re a drummer who is thinking about your long-term hearing, you’d be wise to get an electric kit. The volume can be set as high or low as suits you, which will usually be a lot quieter than an acoustic kit. Electronic kits come in a variety of shapes and sizes, so it’s important to consider what’s important to you before you make a purchase. Of course, these kits are far quieter than acoustic sets, but the volume still varies. If you’re looking for the ultimate in quietness, opt for mesh heads rather than rubber or mylar heads. These make less noise when you hit them. The bass drum pedal can also make a significant sound. To stop this from traveling, you can put the drum and pedal on a thick carpet. This will help to prevent your neighbors from asking what the banging is. You might want to add additional sounds, that aren’t already built into your kit. If this is you, look for a kit with audio inputs and MIDI capability. MIDI can allow you to trigger additional sounds, using a hooked up DAW device. Some kits also have additional inputs for extra cymbals. This is perfect for the drummers amongst you who aren’t satisfied with just a ride, crash, and hi-hat. It’s usually labeled as a ‘crash 2’ input on the kits. Whilst this will still use the sounds that are built-in to your kit, it lets you use more than 7 at once. Also, there’s nothing to say that you have to use a crash sound with this extra input. If you want to record with your kit, it’s important to think about how you’d like to do this and to check your kits outputs. Some have USB recording options, where you can record straight onto a flash drive. Others have MIDI recording options, whilst some have audio outs for recording. If you want to record something that’s easily editable and transferable to other sounds, MIDI is the way to go. However, if you’re happy with your drum sounds and want to get the most authentic recorded sound, using audio might suit you better. A lot of cheaper kits work simply as trigger pads, creating the same noise every time they are triggered. This is OK for beginners, but it quickly becomes limiting. Higher-end kits are velocity-sensitive, have mesh heads and some even allow you to do things like rim shots. If you’re likely to use rolls and flams, at the very least you will need a mesh snare. If you like to get technical across the entire kit, you will require mesh heads on your toms as well. If you are a technical player who requires drums that are responsive to where you hit them, how hard you hit them and need cymbals that can be choked, you’ll be looking at a high-end kit that offers these features. Finally, size might be an issue. If you’re tight on space, which is why you’re considering one of these kits, it’s important to look for something that can easily be folded and put away. Some kits are designed to be put up to stay in position, whilst others have portability in mind with foldable racks or racks that are easily mounted and dismounted. Those looking for something small will benefit from checking how the toms and snare are attached to any racks. If they’re twisted on and highly adjustable, they will also be easy to put away, then get back out again. So, now you know what you’re looking for in an electric kit, let’s have a look at some of the best products on the market. To make things easier for you, we’ve noted the kinds of player each kit will be best suited to, as well as exploring the pros and cons of the kits. Alesis’ Nitro Mesh Kit is a starter level kit, with mesh pads. These pads are extremely responsive, so you can successfully practice rolls and dynamics on it and get the feel of a ‘real’ kit. This kit also has built-in coaching features, which is a great way of making learning fun and accessible. There’s also a metronome to help you focus on keeping consistent timing. There are 60 built-in tracks to play along to, or you can plug your own smartphone or other music devices into the kit via the AUX in. As well as an AUX, there are MIDI and USB ports, options to add additional tom and crash cymbals and stereo line outputs as well as a headphone out. As though all of this functionality wasn’t enough, the Alesis Nitro Mesh Kit has a massive 385 built-in sounds and 40 preset full kits. This makes it an excellent tool for discovering new sounds, experimenting with them and getting creative. The coaching features, the multitude of sounds and play-along functions make this a great kit for kids. The price tag is also not enormous. It will be less suited for the professional drummer, looking for something with even more advanced responsiveness and features. Mesh heads are responsive and ‘bouncy’. 385 built-in sounds give you a lot of creative options and encourage musical discovery. Built-in coaching features and play-along tracks make it excellent for learning on. It’s not as advanced as some other drum kits – you can’t, for example, get rim shot sounds by hitting the side of the drum. It takes up more space than some other beginner electric kits. 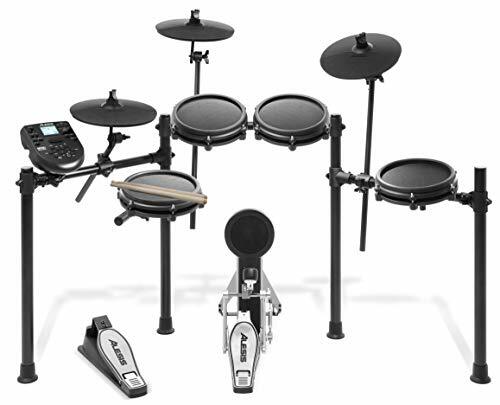 The Pyle PED041 is a 7-piece kit which has each of the drums and cymbals separately connected to horizontal bars, with a controller in the middle. These pads can be fully adjusted to suit your height and the angles you prefer. They’re not made of mesh, so it may be difficult to practice rolls and other tricks that require ‘bounce’, but they are velocity-sensitive, so you can achieve dynamic variation with this kit. It’s very small and can be easily packed away, so it’s great for those who are trying to save space. The price is also budget-friendly. There is an AUX input as well as MIDI output and a headphone jack. You can play along to your favorite music, record your playing to your computer or practice through headphones. 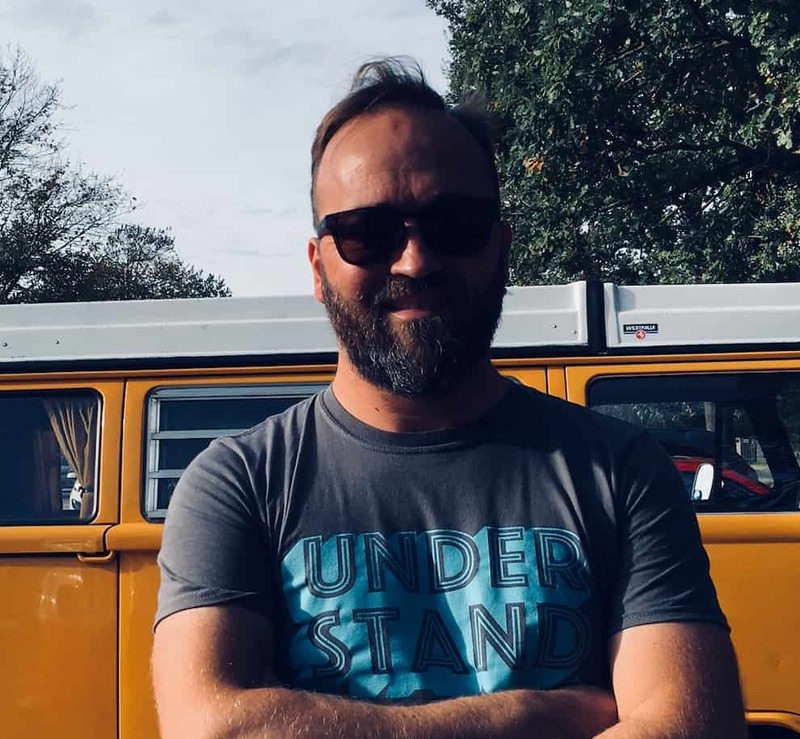 There are just 11 built-in drum kits, so it’s not as creative as some of the kits, but it’s perfect for those who simply want something to practice the drums on, at a reasonable price. The Pyle PED041 will suit learner drummers and professionals alike, who require something to practice their grooves on at home. It’s extremely adjustable and uses little space, so it will suit those who need a kit that they can tidy away. It will be less suited to those looking for an electric kit with lots of fun sounds to play with. AUX input means you can practice to tracks you’re learning. Only 11 built-in drum kit sounds. Pads aren’t made of mesh. Yamaha’s DTX430K is a budget-friendly kit with some of the features of much higher-end kits. It allows you to play with a half-open hi-hat, which will suit those who drum in heavier genres. There are also built-in drum kit sounds for a variety of other genres, including funk, jazz, and R&B. The heads are very responsive, to both velocity and natural stick bounce. There are 169 built-in sounds altogether, so you can mix and match to create your own ideal kit. This kit will suit those who are into modern technology, as it has its own touch app, compatible with Apple and other touchscreen devices, which allows you to interact with your kit in a completely new way. There are USB, MIDI, AUX and audio ins and outs, so you won’t find limits in connectivity with this kit. This kit will suit those who are looking for something of professional quality and with high-end features, at a budget-friendly price. 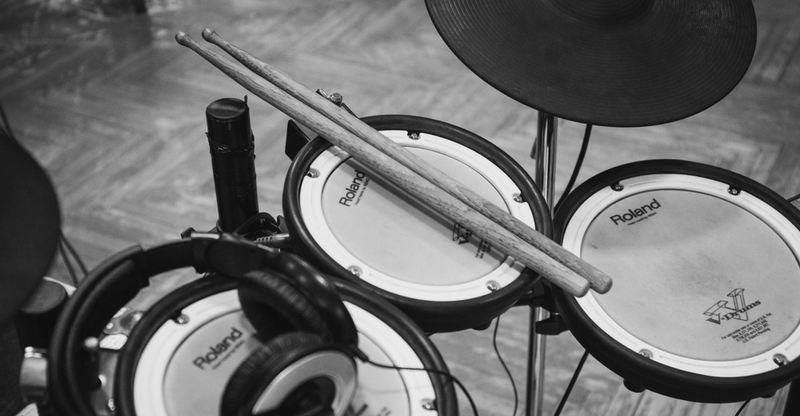 Although it lacks built-in audio tracks and doesn’t have all of the fun sounds available on some beginner drum kits, it will be perfect for the serious drummer. Half-open hi-hat sound is great for heavy genres. Responsive pads give you the feel of a ‘real’ kit. Limited built-in sounds and kits. The heads aren’t as bouncy as on some other, mesh kits. Roland’s TD-11K is a mid-range kit with a lot of useful features. The snare has a mesh-head, so you can successfully roll, flam and drag just like you would on a real kit. The bass drum head also has an innovative design, giving it a cloth feel that’s similar to an acoustic bass drum. The cymbals are also designed with a carefully considered weight, making the swing feel more authentic. There are 50 built-in kits, so you can have fun straight away discovering the sounds of classic kits and beyond, and there are also backing tracks included as well as an AUX input and USB port if you’d rather hook up your own music. There’s a coach mode, which even offers feedback on your progress and there’s an input for an extra crash if you can’t imagine getting by with just a couple of cymbals! This kit will suit intermediate to advanced drummers, for gigging, recording or even just practicing on at home. There are very few limits with this kit, so you can really exercise your skills. It might be less suited to the beginner, due to the price. Mesh snare makes it easy to flam, roll and drag. 50 built-in kits give you easy access to a variety of sounds. Innovative design technology makes the drums and cymbals respond authentically. It’s more expensive than a lot of electronic drum kits. Only the snare has a mesh head. 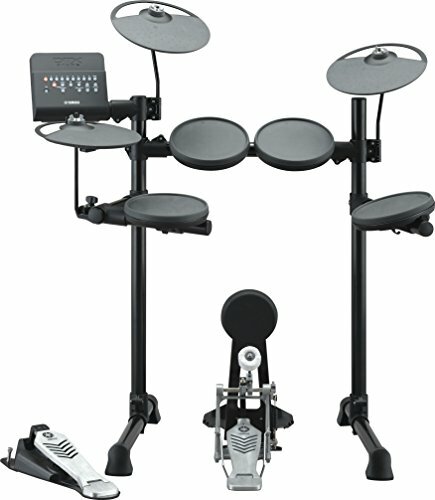 Roland’s TD-25KV is an electronic drum kit designed for the pros, with a price tag to match. There are mesh heads on the snares and toms, so it has all the bounce of a real kit, whilst the sound engine offers professional tones with advanced editing options. There’s an input for an extra crash, an AUX in, MIDI out and master outputs. There’s also a USB port that doubles up as a flash drive connection. You can successfully exhibit rim shots, rolls, drags and even ghost notes on this kit. It’s extremely responsive, even to where exactly you hit it. The cymbals even know whether they’re being hit on the bell, bow or edge. You can instantly record your playing to USB or even loop your beats to jam along to. This is an advanced kit, and as well as having many preset sounds it has built-in effects including reverb, multi-effects and EQ. 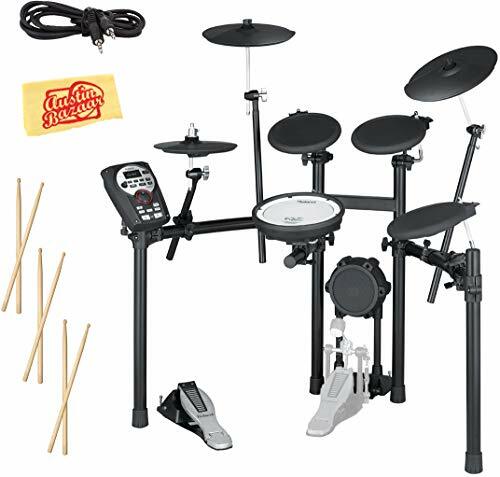 This kit will suit the professional or advanced drummer who requires no limits in their playing. As it’s pretty expensive, it might not be the right choice for a beginner. Responsive cymbals know whether they’re being hit on the bow, bell or edge. You can do rim shots, ghost notes, rolls, and flams with ease. The mesh heads make it feel authentic. You need to buy a kick pedal and hi-hat stand separately. As you can see, the kit you go for depends on your requirements, your budget, and the space you have available. If you’re looking for something to learn on, the Alesis’ Nitro Mesh Kit and Roland’s TD-11K both include a ‘coaching mode’, to help train you to play in time and improve. The Alesis model also boasts a host of built-in sounds, and mesh heads. The Roland kit has a mesh snare and also has cleverly designed cymbals with a weight that responds similarly to real cymbals. Alesis’ kit is less expensive, whilst the Roland model is a mid-range product. If getting value for money is your priority, Yamaha’s DTX430K offers some professional features at an intermediate price. There’s the option to play half-open hi-hat, many built-in kit sounds and even a touchscreen app which hooks up with the kit. Professionals need to look no further than Roland’s TD-25KV. This high-end kit has no end of functionality, even enabling rim shots and bell/bow/edge hits on the cymbals. Finally, those who are looking for something that they can easily pack away when they’ve stopped playing, that’s easy to set up and adjust, will do well with the Pyle PED041. This works as a rack that can be easily mounted, adjusted and dismounted. Whichever electronic kit you decide is right for you, we hope that our reviews have helped you to realize the potential. No longer must drum kits mean disgruntled neighbors.